Franklin-Monroe’s Connor Crist goes in for a score against Twin Valley South in a Cross County Conference matchup on Saturday night. TVS won the game, 72-64. 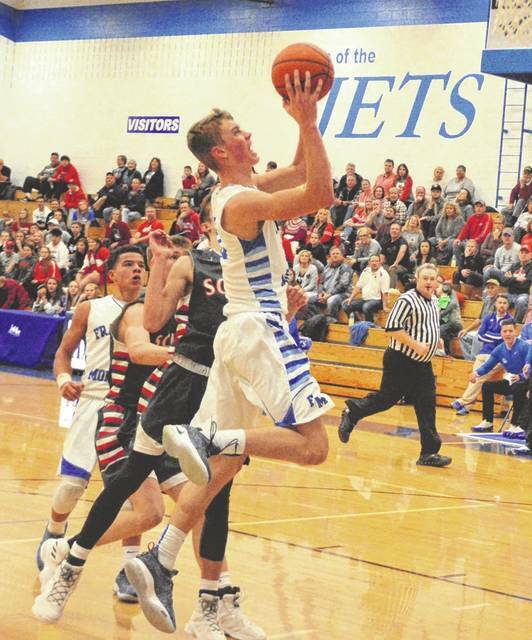 Franklin-Monroe’s Ethan Conley scores 2 of his 25 points on this layup against Twin Valley South in a Cross County Conference matchup on Saturday night. TVS won the game, 72-64. 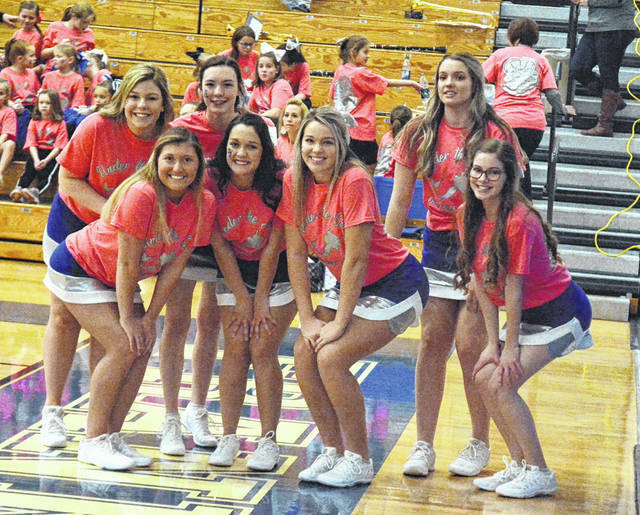 Franklin-Monroe’s pose for a picture during a break in the action of the Jets game against Twin Valley South on Saturday night. TVS won the game, 72-64. 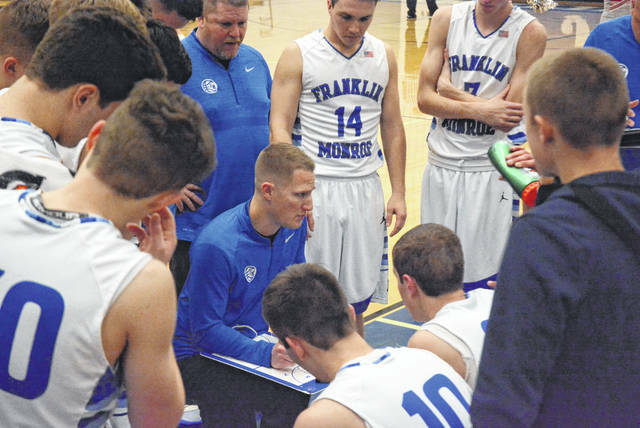 Franklin-Monroe coach Troy Myers talks to his players during a time out in their game against Twin Valley South on Saturday night. TVS won the game, 72-64. 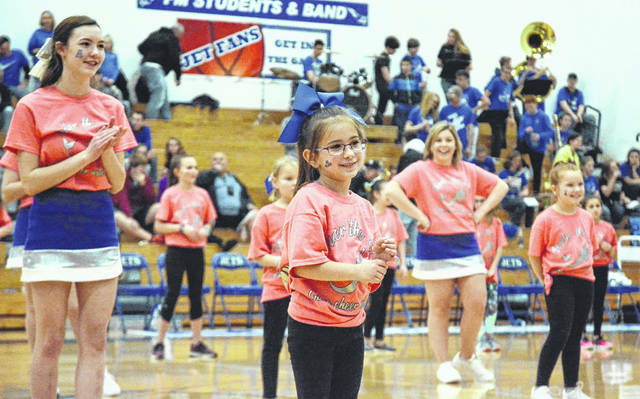 Franklin-Monroe had some youth cheerleaders perform during the Jets home game with Twin Valley South on Saturday night. Franklin-Monroe’s Jordan Rhoades puts up a shot from underneath the basket during a Cross County Conference matchup against Twin Valley South on Saturday night. TVS won the game, 72-64. PITSBURG – Like a gunslinger, the Franklin-Monroe Jets emptied both barrels against Twin Valley South on Saturday, but as the smoke drifted away and the dust settled to the ground it was the Panthers who were still standing. The Jets gave their all for four quarters – adjusted and readjusted in a pitched battle, but the Panthers would fend off the Jets last minute charge and ended their weekend with a 72-64 win as the Jets would lose their second close game in a row to a league opponent. The game was quite the chess match as the two coaches changed lineups, offensives and defenses, throughout the game. South opened with a zone and the Jets opened with a man-to-man defense. 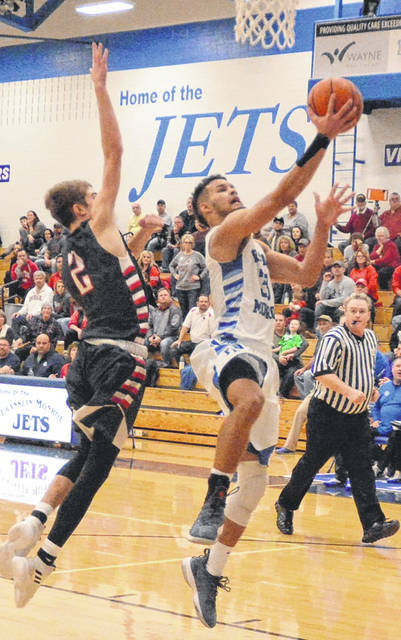 When the Jets tried a zone to take away South’s ability to drive to the basket, Panther Nate Osbourne began to light up the scoreboard with treys. So they had to drop that and return to man to man. Later in the game the Jets would use a diamond and one to stop Cole Peterson when he got a hot hand. But it was like the little Dutch boy trying to plug the dike. As soon as they cooled down one shooter, another Panther would step up and start scoring. The Panthers on defense seemed focused on stopping Ethan Conley. He could not get off a shot with at least two Panthers draped upon him. TVS also pressed intermittently throughout the game. At the half, it was 36-29 in favor of TVS. The Panthers roared out of the locker room and opened a 14-point lead 54-40. It did not look good for the Jet faithful. In the fourth quarter, the Jets gave TVS a dose of their own medicine and began full court pressure. They generated a few turnovers and began chipping away at the lead. The momentum was beginning to swing. 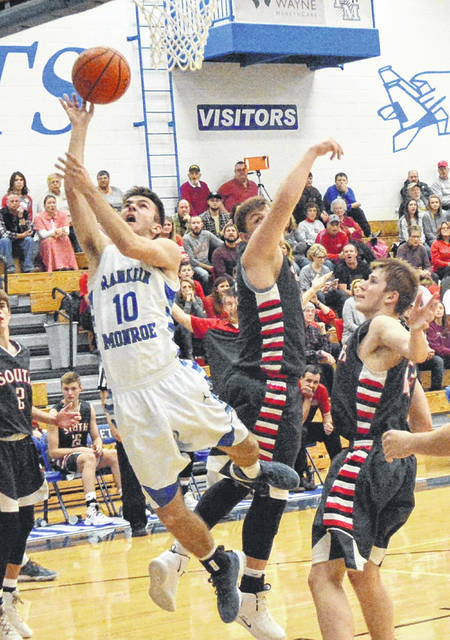 Franklin-Monroe’s Connor Crist had only scored 2 points in the first half, but in the fourth quarter as the team made a hard charge at the Panthers he rose to the challenge and scored 12 points. With 37 seconds left he got the Jets to within 6 on a shot made under the basket. But now the Jets had to begin fouling. Ky Cool appeared to have a clean steal with 16 seconds left, but the refs saw otherwise and he got his fifth foul and was done. South was steady from the foul line and were able to walk away with a hard fought win. “I was really proud of our effort,” Myers said on the game. “Two nights a row where the kids just gave tremendous effort. We lost both games, but I still feel that we are on the right trajectory. When go back and look at this, we will see that we did a lot more things right than we did wrong. Scoring for the Jets: Ky Cool 9, Jordan Rhoades 9, Connor Crist 14, Luke Booher 2, Jackson Crist 5, Ethan Conley 25.